By Roy Wyman, Remote Off-Site Monitoring. When considering starting a remote monitoring facility, there are a few fundamental items that should be well thought out before you jump into action. The location of your proposed control room is critical. Are you considering placing it in a high-risk area where your own security risk is greater than the clients you want to monitor? 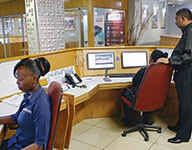 Can your surveillance staff get to work after hours and on weekends or during strikes or on public holidays? Is there a good landline telecommunication infrastructure in place, is it also covered within wireless broadband coverage? Connectivity is the most important factor when designing your facility, regardless of all the effort put into the rest of your facility – if you don’t have good connectivity your control room just can’t prosper. • Uninterrupted mains incoming power. • Copper-based digital data connectivity. • Wireless-based digital data connectivity. • Connectivity server, firewall or VPN switch. • Video monitoring server and EMS software (event management system). • User station with associated software. The second most important factor when considering a control room is the training of your surveillance operators. Unfortunately, there is not a pool of well-trained surveillance operators in the security industry. When considering employing operators, some of the most important factors are computer literacy, observation skills and communication skills. 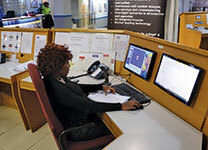 A well-organised control room will always consist of shift supervisors and a good, suitable control room manager. The managers and supervisors must know all your clients’ site instructions by heart, to ensure your controllers get maximum benefit from their knowledge. The managers and supervisors must also be very IT-literate, so they can assist with small day-to-day problems. As training is not a fixed syllabus due to ever-changing security requirement, it is impossible to train an operator to a point that he/she knows everything. Training never ends. 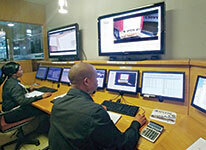 When designing your control room, it is important to take the SAIDSA specification for CCTV control rooms into account. From an operational point of view, it is also a good idea to separate your surveillance operational area from your IT area. Air-conditioning and air-flow is also critical to ensure your equipment and staff don’t overheat. Your operator console design is also important for workflow. A well-designed console will ensure an easy workflow for the surveillance operator, enabling them to view and respond to a situation with the necessary tools to complete the job with ease. The availability of a phone, stationery and workbooks within reach while an eye is kept on the monitors is also important. monitoring has both recording and transmitting capabilities as well as transmitting-only capability. The reason for this is that your client’s site may have existing cameras and a recorder, thus he does not need you to sell him an additional DVR – a transmission-only system would suffice. It is also vital that the product you select has bi-directional audio and alarm inputs and outputs. It is important firstly that the software used to monitor your client’s site is not just a network remote viewer application, but a fully integrated server-based Event Management System (EMS) with unlimited workstation access. The EMS software must interface between your client’s site and your operators, allowing them to access sites randomly and manage incoming alarm events. The EMS should have the ability to manage twenty simultaneous connections consisting of incoming alarms and live connections. A very important factor to the software is good local support and flexibility to suit your exact needs. Although it seems that the services provided by telecommunication companies are improving, you can never rely on only a single service provider. Consider your secondary option, 3G, Neotel, I-burst, or was that your first option? When a site fails due to the communication infrastructure failing, a secondary option is vital. In the event of a communications breakdown, your system needs to automatically switch between your primary and secondary options, resulting in a seamless transition. A wide variety of cameras are available from models produced all over the world. Cameras are installed to assist the controllers viewing the site. Why then install a camera on which the focus and aperture cannot be set? You, as the monitoring company, will have to deal with the explanations when there is an incident. No client wants to hear that when you did the installation you only thought of cost and not image quality. The main purpose of off-site monitoring is to detect, view and respond to a situation before it results in damage or loss to your client. Cameras should carry a manufacturer’s guarantee and must have the ability to be repaired instead of thrown away. A good housing and bracket will ensure the stability of the camera during windy times and shield the camera from rain and fog. Going ‘cheap and nasty’ for remote monitoring purposes is not a good idea, knowing that your technical team will have to visit your client’s site every week to repair or replace cameras while theft is an ongoing problem for your client. Video motion detection (VMD) is generally very unstable, thus using VMD to trigger alarms to monitor the site is not a good idea. You should rather consider passive infrared detectors and infrared beams to trigger an alarm situation. Your local alarm supplier can assist you with selecting the correct product for your unique application. We live in the 21st century where the availability of technology is wide-spread. 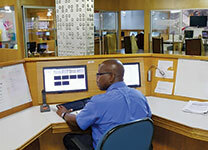 Security technology is now setting new standards to ensure criminal activity can be reduced. In the event of off-site monitoring, ensure that you can provide your client with the best technology available on the market rather than failing to ensure the greatness of remote off-site monitoring. With this all considered you will now have a better insight to what is required to ensure you can supply an acceptable service to your client. From a budget point of view, excluding the building, to set up an acceptable level of control room will cost you in the vicinity of R1,2 to R1,5 million. Alternatively, there are suitable monitoring facilities out there which would gladly facilitate you inside their existing facility, giving you a dedicated console or even an entire area which you can advertise and sell as your very own. The advantage of this is that there is no upfront capital outlay and you can generate income from your first client. Remote Off-Site Monitoring (ROM) specifically caters to this need, as well as remote monitoring for numerous installation companies as well as guarding companies. ROM also has the understanding that if you want to start your own monitoring facility once you have enough clients at ROM, you may leave with your clients, without prior notice. 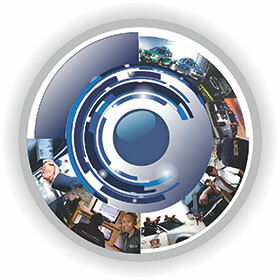 Please feel free to come and visit ROM’s facility for a deeper insight into remote off-site monitoring.